Tips and information on the use of aloe vera gel, aloe vera plant info, as well as sharing experiences, other remedies, etc. I have always loved a good cold glass of Pepsi. Every week I would buy two or three 2-litre bottles for my house and they rarely last a week. Three or four days tops, then I would have to replenish the supply. I know it has a bad reputation, what with the high levels of sugar and calories that has contributed to the extra pounds I’m carrying but it also has medicinal purposes. 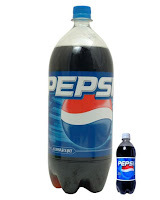 A dear nurse friend of mine had recommended hot Pepsi or Pepsi not yet refrigerated for upset stomach/vomiting and gas and I’ve been using it for that ever since. 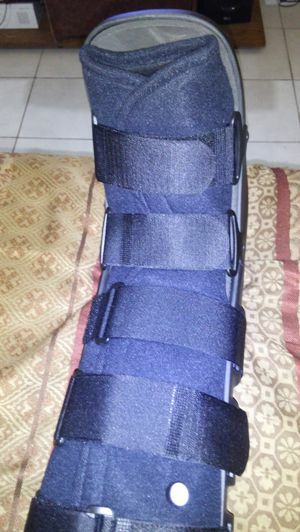 Well, I recently broke my ankle, badly. Fractured in three places, the foot flapping like an alien flag and had to have it splintered before they could move me. Then I was in a cam walker for a few hours …..
Long story short, I had surgery the following day and they used a spinal anaesthesia so I would be half awake and could go home later that day. The anaesthesiologist told me that with this type of anaesthetic comes the side effect of a headache sometimes when I’m getting up. Her recommendation? Drink at least 2 litres of water daily, including a small bottle of Pepsi. Who knew? Pepsi for headache! And it worked! The Pepsi worked! I was so happy because I really don’t like taking too many drugs. 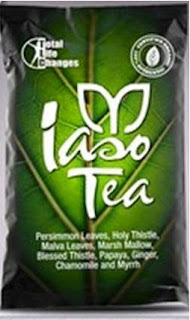 After discovering the Iaso tea, I thought that I would give up drinking sodas for tea but I cannot do that, not totally. Pepsi has proven why it must remain on my grocery list. I wonder how many persons agree with me? Nine Natural Herbs -100% Organic and Caffeine Free. These nine powerful Iaso Tea ingredients make this tea one of the most effective, best-tasting weight-loss and body detoxifying products available anywhere. Compounds in Persimmon Leaves have been shown to help remove excess fat from the body. The tannins and flavonoids in Persimmon Leaves are also believed to have anti-hypertensive, anti-carcinogenic, and anti-mutagenic properties. Persimmon Leaves have been used to help alleviate digestive problems and dermatitis, and also act as a natural antihistamine, which helps reduce allergic reactions. Holy Thistle has been used medicinally for more than 2,000 years. A flavonoid in the fruit, called Silymarin, is a powerful antioxidant that may also protect the cells of the liver by removing and blocking the entrance of harmful toxins. Holy Thistle is believed to have great power in the purification and circulation of the blood, and has been used to cure chronic headaches. It is also used for stomach and digestive problems, can strengthen the heart, and is good for the lungs and kidneys. The Malva, or Chinese Mallow, plant has been used for centuries to soothe the membranes of the digestive system and treat a variety of conditions from stomach ache and gastroenteritis to irritable bowel syndrome. It can also soothe bronchial irritation in people with bronchitis or emphysema. A natural anti-inflammatory, Chamomile can be used to treat digestive disturbances, gastrointestinal spasms, inflammatory disease of the gastrointestinal tract, coughs and colds, fevers, and bronchitis. It’s mildly sedating and muscle-relaxing effects can also help those who suffer from insomnia fall asleep more easily. WARNING: This product contains cathartic herbs. Pregnant and nursing women, the elderly, children, and individuals suffering from any illness or health condition should consult with a physician prior to using this or any herbal supplement. 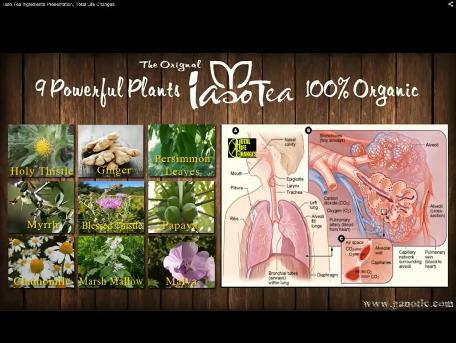 IasoTea is not a drug, nor intended to diagnose, treat, or cure any disease or illness. You should consult with your physician before starting this or any other cleansing exercise or weight management program. What we are consuming should make a difference in the way our bodies look, feel and perform, agreed? 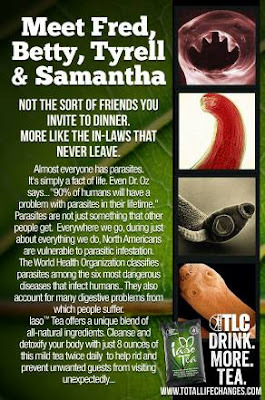 Okay, and did you know that some of the things we eat that we think are good for our health could contain parasites? Uh, uh! Whether you eat meat or not, you could be consuming foods that are introducing parasites into your body. Did you know that there are worms living inside the human body that can grow up to 50 feet long? Imagine that! I remember my aunty used to say “come, time for some wash-out”. In Jamaica wash-out meant drinking something awful that would cause cramping stomach pains and have us making countless trips to the bathroom for welcome relief! But thank God those days are over and we have come a long way since then. Lately, I have discovered a product that is so “nice” that you hardly even notice what’s happening. 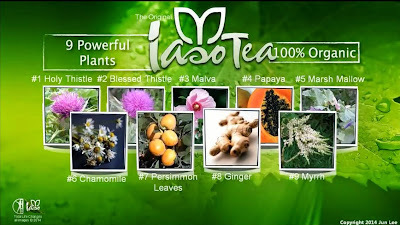 It’s called Iaso tea and I am proud to be able to recommend it to the world. 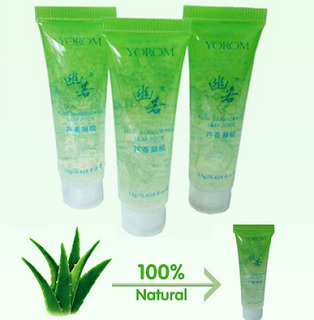 It is 100% organic and is composed of 9 natural herbs. Iaso tea is clinically proven safe and effective for over 25 years. This is the tea that’s changing lives. 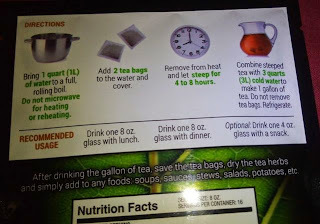 One packet contains 2 tea bags and together they brew 1 gallon of delicious iced tea. It is very convenient in that once you have prepared the gallon; it is kept in the refrigerator and will usually lasts about a week if you are drinking 2 cups per day. When you have finished drinking your tea, the contents of the used bags can then be sprinkled over your stews, vegetables, etc. for added benefits. I like to sprinkle it over my dogs’ food because dogs need regular de-worming. If you are using the Iaso tea to lose those extra pounds or a protruding stomach and you are not seeing results as fast as you wish, remember that we all have different metabolisms. Some of us will lose weight faster than others but if you persevere, you will see those results and you will be true to losing weight naturally. NB. The Chaga, Resolution, Sexual Enhancers and Body Shapers are not shipped to Jamaica.